Summary: Among the many contentious issues related to genetically modified organisms (GMOs) under public discussion, legal issues are in the spotlight. There is debate as to how much patent protection, if any, should be granted to GMO companies, and whether the patent rights have been utilized rightfully against farmers. The court seems to be by and large standing with the companies. This article provides an overview of GMO patents and related litigation to help you understand why. The documentary David versus Monsanto, released in 2009, moved many people. It tells the story of a Canadian farmer whose land was contaminated by proprietary GMO plants from Monsanto, a big biotechnology company, and was sued by Monsanto for infringement. The Canadian Supreme Court ruled in favor of Monsanto. The documentary and other social media reactions have caused a backlash directed towards the GMO industry, and Monsanto has since become notorious for allegedly abusing legal rights. As one commenter on Amazon said, “whether or not you believe that GMOs are safe for human consumption, … you want to avoid GMOs at all cost” because of the “unbelievable greed” of biotechnology corporations. What is the truth behind the story? Has the patent system truly become a vehicle for big corporates to monopolize the market? To answer these questions, it is important to understand what is legal under current patent laws. Why are GMO companies granted patents? Patent rights on novel inventions are authorized by the US Constitution. The purpose of the patent system is to give inventors a period of exclusivity for commercial development of products, thereby encouraging innovation. The discovery, development, and authorization of a new GMO plant costs $136 million on average , and companies would not have been willing to make such investment without a period of exclusivity and profitability granted. But in the long run, the patent rights are not intended to be given at the price of public interest. 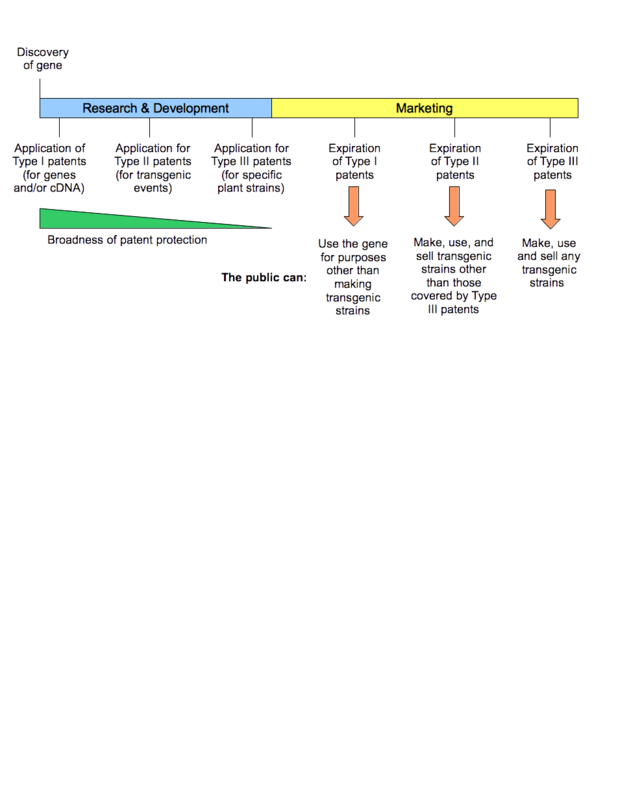 Utility and plant patents have a patent term of 20 years from the initial filing, so GMO patents protect a marketed product for about 15 to 20 years after the time of product development (see Figure 1). For instance, Monsanto’s Roundup Ready soybeans launched in 1996 (see this article), and US Patent Nos. 5,352,605 and RE39,247, the core patents underpinning the product, expired in 2011 and 2014, respectively. After a patent expires, the invention becomes public knowledge to which other companies, farmers, and other interested parties have free access. At that time, the GMO can be mass-reproduced and the underlying genetic design can be utilized by anyone to develop improved versions of the GMO. This eventual free access is one way in which GMOs developed by private companies could bring about public benefit (see this article and this article). Figure 1. The timeline of typical transgenic GMO patents. In the U.S., the patent term is 20 years from the initial filing. What is covered by the GMO patents? At first sight, GMO patents should protect GMO plants. Among the wide spectrum of inventions covered by US patent law, plants are indeed patent-eligible. As long as one discovers or invents a new plant in a cultivated state and is able to asexually reproduce it, he or she may obtain a patent on the plant. Congress passed the Plant Patent Act in 1930 as a result of plant breeding and other agricultural efforts, making new plant strains derived from crossbreeding patentable. Since then, the act has also incorporated plants produced from modern biotechnological methods, such as integration of foreign DNA into plant genomes. Interestingly, GMO companies often don’t seek plant patents for their plants and seeds. Instead, they obtain utility patents, a different type of patent with more stringent requirements on the description of the invention. While plants discovered by chance or generated by crossbreeding oftentimes don’t satisfy these requirements, detailed information of GMOs at the molecular level is usually available. Utility patents have several advantages over plant patents. First, utility patents may cover inventions beyond plants. If a GMO involves integration of novel, foreign DNA into the plant genome, the uniquely designed DNA can also be protected by utility patents. Second, utility patents provide better protection against infringement. As seen in the Supreme Court case Bowman v. Monsanto discussed later in this article , utility patents prohibit the replanting of seeds harvested from a licensed plant. In contrast, plant patents allow licensees to sexually reproduce indefinitely, as long as they don’t provide or sell the seeds to others for planting . Therefore, utility patents provide more extensive protection for GMO plants. The two patents involved in Bowman v. Monsanto are utility patents for DNA sequences. One relates to engineered genes that allow for robust production of foreign proteins in the plants. The other covers the gene encoding an enzyme that gives rise to Roundup tolerance . 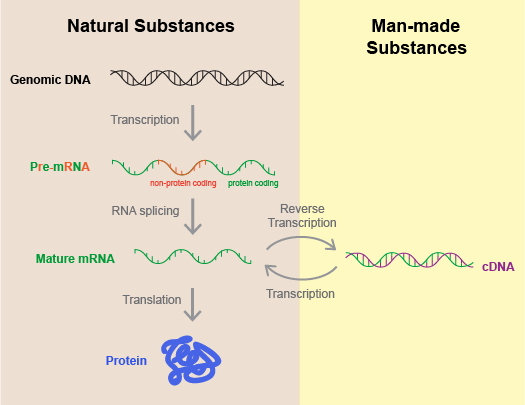 Gene patents were recently ruled by the Supreme Court as invalid, but GMO companies are still able to obtain patents on complementary DNA (cDNA), an edited version of the original gene (see Figure 2 for an explanation of how cDNA differs from natural DNA). By patenting the cDNA sequence of a gene and its variants, GMO companies can prevent others from introducing the gene to any other plants without having to obtain individual patents for each plant. Under such patent protection, Monsanto generated Roundup-tolerant soy, corn, cotton, canola, and alfalfa using the same core technology. Other GMO front-runners, such as Bayer and Syngenta, also predominantly possess utility patents on GMOs. The patent eligibility of cDNA, recently endorsed by Supreme Court, is still under discussion among scientists and patent practitioners . Nevertheless, GMO companies have followed existing laws, and their patent portfolios do not exceed what is normally allowed in the biotechnology industry. If the interpretation of patent law is changed by new Supreme Court cases in the future, the enforceability of their patents will be adjusted accordingly. Figure 2. The synthesis and function of complementary DNA (cDNA). cDNA has a complementary sequence to the corresponding mature messenger RNA (mRNA). The Supreme Court ruled that cDNA is patentable because it does not exist in nature. However, in terms of the genetic information it carries, it is essentially a copy of mature mRNA that is present in nature. cDNA differs from the original gene in that non-protein coding regions have been removed. In the laboratory, it is oftentimes preferably used as the starting material to synthesize a protein. Why did Monsanto sue the farmers for infringement? Monsanto obtained patents that were allowed under the laws then in effect, but did they abuse their patent rights? There is a popular misconception that Monsanto sued farmers for selling its proprietary crops, even though those innocent farmers unknowingly harvested their Roundup-contaminated land. According to the Supreme Court record, however, that was not the case. Percy Schmeiser, the main character in David versus Monsanto, went to great lengths to enrich the Roundup Ready canola plants that originated from his neighbor’s land: by treating his crops with Roundup, he ensured that only the resistant strains persisted. In the following seasons, he replanted the seeds without having a licensing agreement with Monsanto. The unusually high prevalence (95-98%) of tolerant plants in Schmeiser’s fields clearly demonstrated infringement in the eyes of the court, and Monsanto claimed rightful remedy for its loss of profit . Schmeiser infringed on Monsanto’s patents because he did not obtain a license. But what if a farmer licensed the patents initially, and replanted the harvested seeds in the following seasons? The US Supreme Court case Bowman v. Monsanto dealt with this question. They introduced a legal doctrine called patent exhaustion, which states that patent rights are applied only to the first sale. Any subsequent owner of a patented article other than the original seller may use or sell the thing without patent restriction. Based on this doctrine, Indiana farmer Vernon Bowman, who replanted the seeds that he harvested from his licensed Roundup tolerant plants, argued that replanting the seeds was a way of “using” the patented product and did not trigger infringement. Monsanto claimed that the right to “use” a patented item did not include reproducing it, just like you may read, sell, lend, or destroy a copyrighted book, but you must not make copies of it. The court ruled in favor of Monsanto . While Monsanto has not sued farmers for merely possessing contaminated crops in their fields, there is nevertheless a legal loophole. Are you infringing a patent by selling your soybeans that contain a minor amount of contaminating Roundup tolerant seeds from your neighbor’s land? Are you infringing a patent by replanting those seeds? While you don’t intend to use or sell Monsanto’s crops, intention is not material to patent infringement. All that matters is the mere existence of Monsanto’s crops in your harvest. To avoid having its public image further jeopardized, Monsanto promised that they would not sue farmers whose crops inadvertently contain less than 1% of their patented crops. However, this number is rather arbitrary and is not backed up by federal regulations. Further measures will need be taken to clarify the legal issues herein to prevent GMO companies from abusing their patent rights. The US is a leading country in biotechnological innovation, and the number of biotech patents issued in the US has been increasing steadily in the past few years . While new issues continue to arise, the patent system is also modulated by legal reform. A recent cornerstone is the American Invent Act, which took full effect in 2013. This Act changed the US patent system from first-to-invent to first-to-file, encouraging timely filing for patents. This Act also introduced extensive options for post-grant proceedings that allow third parties to challenge the validity of patents more easily. These changes boost transparency and flexibility in granting patents of proper coverage, setting a firm judicial ground for future litigation upon patents. With the legal system adapting alongside biotechnological innovations, more high quality innovation in GMOs is likely to come to light in the future. Wen Zhou is a postdoctoral fellow at Harvard Medical School. 3. Wright BD. Plant Genetic Engineering and Intellectual Property Protection. Agricultural Biotechnology in California Series, Publication No. 8186 (2006). 7. USPTO Patent Technology Monitoring Team. Patent Counts by Class by Year, 1977 – 2014. Data of Class 435: Chemistry: Molecular Biology and Microbiology. Thank you for writing and publishing this article. 1. what is the legal procedure to do that? 2. From where I can get the genes or the Agrobacterium containing the genes? 3. Is there any legal bindings once I obtain genetically transformed cereal crops with these genes? if so what is it and for how long? The article doesn’t address pollination as a factor in contaminating someone else’s crops with GM genes. GM pollen could be harmful and unwanted to an organic or traditional grower. Next Next post: Good as Gold: Can Golden Rice and Other Biofortified Crops Prevent Malnutrition?